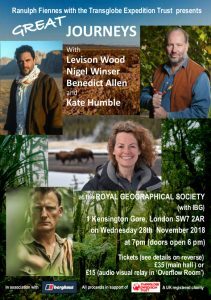 Transglobe Expedition Trust Annual Lecture Evening. Doors open at 6pm for a 7pm start. Now in our 12th Year we present another great line-up of speakers who have undertaken remarkable journeys. This time we focus on tropical rainforests and deserts. Our annual evening continues to be as popular as ever. The mix of speakers and the opportunity to mingle before and after the show with a like-minded audience of regulars and newcomers makes for a truly memorable evening. 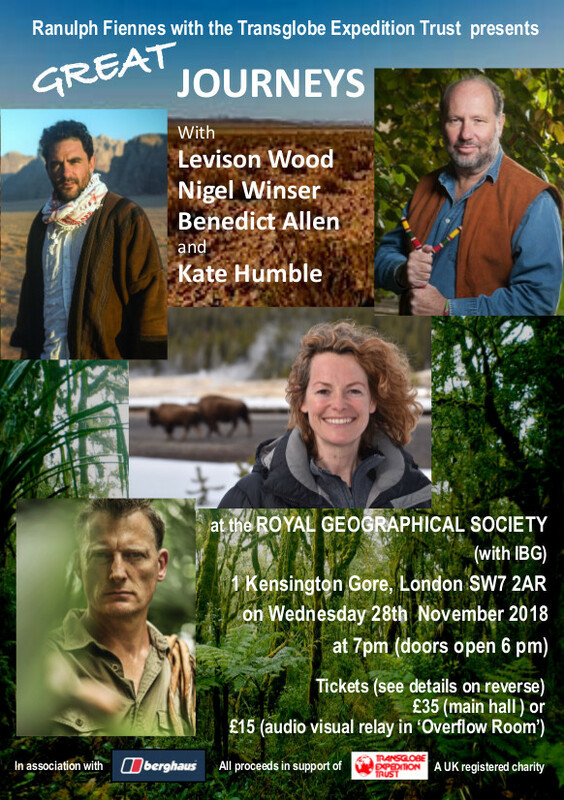 As always, we are extremely grateful to the RGS and the speakers who, with the trustees, and our generous supporter, Berghaus, welcome you to another great evening. We very much look forward to seeing you. Levison Wood is a professional explorer, writer and photographer. Since 2014 he has had four critically-acclaimed Channel 4 documentary series, in which he has walked the length of the Nile, Himalayas and the Americas and crossed the Caucasus in From Russia to Iran: Crossing the Wild Frontier. Levison’s second book, Walking the Himalayas was voted Adventure Travel Book of the Year at the Edward Stanford Travel Writing Awards and his most recent, Walking the Americas, was a Sunday Times bestseller. He is an elected fellow of the Royal Geographical Society and the Explorer’s Club. He has recently completed a circumnavigation of the Arabian peninsula, taking in thirteen Middle Eastern countries, which will become a documentary series and book later this year. Nigel Winser was born in Kenya and trained as a life scientist at Westminster University where, as an undergraduate he undertook biological surveys across the Sahara, the forests of South West Ethiopia and the riverine forests of the Tana River in Kenya . In 1976 Ran and Ginny Fiennes gave Nigel tremendous support and advice when planning the first source to sea expedition down the Tana River. He still owns the Avon Redshank Ran used on his famous Norway expedition. Since then Nigel and his wife Shane have worked with pioneers in the field- science community all their lives at the Royal Geographical Society with Directors, Dr John Hemming and Dr Rita Gardner. More recently Nigel joined Earthwatch as a facilitator of geographical research and ‘citizen science’ programmes worldwide. Nigel’s expeditionary work included international surveys in Sarawak (Gunung Mulu National Park), north Pakistan (Karakoram), the Wahiba Sands in the Sultanate of Oman, the Badia region of Jordan and the pristine forests of Brunei Darussalam. He is currently working with teams in Sultanate of Oman, the Il Ngwesi Maasai community in north Kenya and as a Trustee of the Nekton Mission which is surveying the little know bathyal zone in the Indian Ocean (200m – 3,000m deep). Nigel has an honorary Doctorate from Westminster University and has been awarded the Patron’s Gold Medal of the RGS and jointly with Shane, the Mungo Park Award of the Royal Scottish Geographical Society. He enjoys being a mentor to future field scientists seeking purpose. Kate Humble is a writer and television presenter specialising in live and factual programming. Her television series include Back to the Land, Animal Park, Arctic Live, Lambing Live, Springwatch, Yellowstone, Off the Beaten Track, Extreme Wives, and Living with Nomads & Wild Shepherdess. ShealsopresentedtheawardwinningcomedygameshowWildThings,wildlifequizCuriousCreaturesandhasmadeguest appearances on Would I Lie to You, 8 out of 10 Cats & Countdown. Sheistheauthorofthreebooks–includingtherecentlypublishedThinkingonMyFeet: TheSmallJoysofPuttingOneFootinFrontofThe Other. She has been a columnist for The Telegraph, Top Sante, Country Smallholding and regularly writes for The Telegraph travel and weekend sections. She set up Humble by Nature, a rural skills centre on her farm in Wales and founded Humble, a range of environmentally friendly, biodegradable bath & beauty products. She was the first female president of the RSPB for 110 years. She is currently president of WWT and is a qualified commercial diver. If you need barnacles removing from the bottom of your boat, she’s your girl. Sarah Outen’s expedition London to London via the World. After setting out from London on 1st April 2011, Sarah has been kayaking, rowing and cycling her way around the world Although a solo expedition, this is to be a shared adventure – bringing the expedition to classrooms, offices and homes right around the world. 5000 Mile Project – Katharine and David Lowrie completed an epic expedition to run the length of South America in a year for the continent’s wild lands and wildlife. They ran without support, whilst pulling a trailer they made from recycled materials. As well as running, the 5000mileproject helped to connect people from around the world to South America’s precious remaining wildernesses, to illustrate how daily choices affect these areas and how with small steps everyone can conserve them. They have created the “Big Toe Classroom”, which is full of information on the continent and provides a real-life expedition for schools in the UK and around the world to get involved in. In between arduous running sessions, they present to schools in South America about the project, the local habitats and importance of functioning ecosystems. They also carry out a daily bird census and collect data on the wildlife and habitats they pass, reporting their findings to local and international conservationists. Huautla Expedition – In 2012, Chris Jewell and his team of Cavers and Cave Divers began a two year project to explore further than anyone has before in the Huautla Cave System in Mexico. Using state of the art technology the team spent many weeks underground, diving through flooded cave passages, camping in the dry passage beyond and exploring the unknown cave. An expedition like this is a fantastic example of ingenuity, perseverance, determination, team-work and triumph over physical elements. Stewart McPherson’s project, Conservation in Britain’s most remote Overseas Territories, aims to raise public awareness of Britain’s Overseas Territories (initially Montserrat, Ascension Island, Saint Helena, Tristan da Cunha and the Falkland Islands) and through detailed investigations, provide management solutions for the unique conservation challenges they face today. The findings of this research have identified conservation priorities and common strategies for local governing bodies to help secure a sustainable future. The Trans-Papua Expedition went to explore the historic inter-tribal trade connection between the Papuan interior and its coastlines. In the first complete crossing of Papua’s width – from the River Noordoost to the mighty Mamberamo River – the 2 man team travelled on-foot and by kayak. They will map and uncover the sources of the island’s greatest rivers and answer one of Papua’s enduring mysteries: How, long before European exploration, did Papuan products make it out of the highland interior to mainland Asia? The Derewo Descent – a kayaking expedition with a primary aim of exploring previously unvisited upland gorges of Papua’s remote river system. The 3 man team descended the rivers in an expedition that tested both physical skill and determination while encountering new landscapes and people. The Wild Camel Protection Foundation for survey of the critically endangered Bactrian Camel and their 2011 expedition to the Taklamakan Desert, Xinjiang Province, China. John Hare and Chinese scientists went in search of these elusive animals which were previously not known to exist in this region. University of Edinburgh Altitude Research Expedition to Mt Kilimanjaro, Tanzania, for studies into the incidence and mechanisms of altitude sickness. Adrian McCallum,Tristam Kaye and Hugh Bowring for their parts in assisting in the organisation and operations of The Coldest Journey, the first attempt at crossing the Antarctic continent during the southern winter. Endure Greenland Crossing – Ben Thackwray and Ian Couch’s attempt at a record-breaking ultra-lightweight crossing of Greenland on skis. Walking The Amazon Ed Stafford’s remarkable 2 year expedition to walk from the Peruvian Pacific coast, over the Andes and along a tributary to the Amazon estuary and the Atlantic coast. The Scientific Exploration Society for a biodiversity research expedition in Ethopia to the Beschillo and Blue Nile gorges which included the first descent of the Beschillo River. To establish, develop and maintain a trust fund from the income of which periodic grants will be made to humanitarian, scientific or educational projects which, in the opinion of the trustees, reflect the spirit, dedication and inspirational values of the Transglobe Expedition and which would enable those benefiting from such grants to achieve worthwhile ambitions and inspire others to do likewise. The trustees will, from time to time, consider applications which have been submitted during the period since any previous award. The investment income accumulated by the trust fund will be used to support those projects which are considered by the trustees to be most appropriate to the aim described above. Applications can be submitted at any time. Applicants may use the attached form together with outline details to make an initial request for a grant.